This is a once in a lifetime chance to get a solar bag designed by top designers like Diane von Furstenberg, Tommy Hilfiger, Loomstate, Loeffler Randall, Lutz & Patmos, Rogan, Vena Cava, and Zero + Maria Cornejo worked with Sheila Kennedy to create sun power hungry bags. Kennedy who founded the Portable Light Project, a non-profit initiative that provides solar textile kits to empower the world’s poorest people who do not have access to electricity and these top designers came together for ELLE Magazine’s ‘Green Issue’ to demonstrate how good looking solar bags can/could be made and to highlight the usefulness of solar power harvesting ‘on-the-go’ products for people in regions on our planet who have not the luxury to have a wall wart in their house or even village. The designers where given from Kennedy the FLAP (Flexible Light and Power pack) module consisting of an 13″ x 4.75″ flexible solar panel, rechargeable batteries, an HBLED (High Brightness LED) light and a USB port. 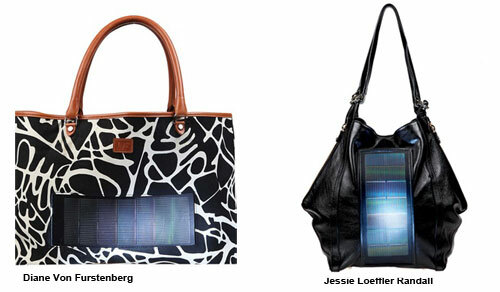 These gorgeous looking solar bags will be auctioned off at eBay starting today, July 5th until bidding ends on July 15th. 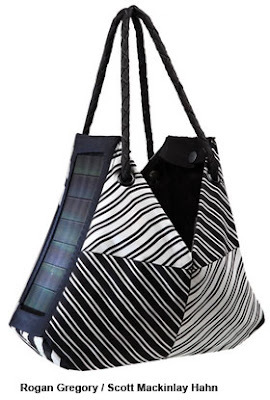 All profit will go towards the nonprofit, Portable Light Project.It is amazing how beautifully looking solar bags top designers can make considering they had to use a standard flexible solar panel module.